This site has been rather quiet for the past couple weeks, but for a good reason: I’ve been touring with the Loud Poets in London and at the Brighton Fringe Festival! They had me along as a guest poet on their show, a techie, flyerer, and social media manager, among other roles everyone played as part of a small touring artistic collective. I couldn’t have asked for a more dedicated, talented, and fun group of folks to tour with: the Loud Poets are wonderful people as well as brilliant artists. The tour was thrilling and highly successful, with crowds highly engaged and audiences swelling as buzz spread about Loud Poets throughout the tour. The entire Loud Poets crew out flyering: Back row, L to R – Catherine Wilson, Doug Garry, myself, Kevin Mclean. Front row, L to R – Michael Wood (drums), Fiona Liddell (violin), Agnes Török, MiKo Berry. • and performing outside of Scotland! Like any tour, this one certainly had its ups and downs—from performing to three people to packed houses, from the elation of seeing the English coastline to the exhaustion of driving through the night from Edinburgh to London and back. It tested all of us: our endurance, our ability to perform poems while so tired we couldn’t do simple math, our patience and kindness when sharing a tiny hostel bathroom with seven others. The experience was an important reminder to me of how much work goes into being a professional artist. So much time and effort is put into things that are not your art. For instance, on this ten-day poetry tour we only spent a total of eight hours physically performing our poetry. 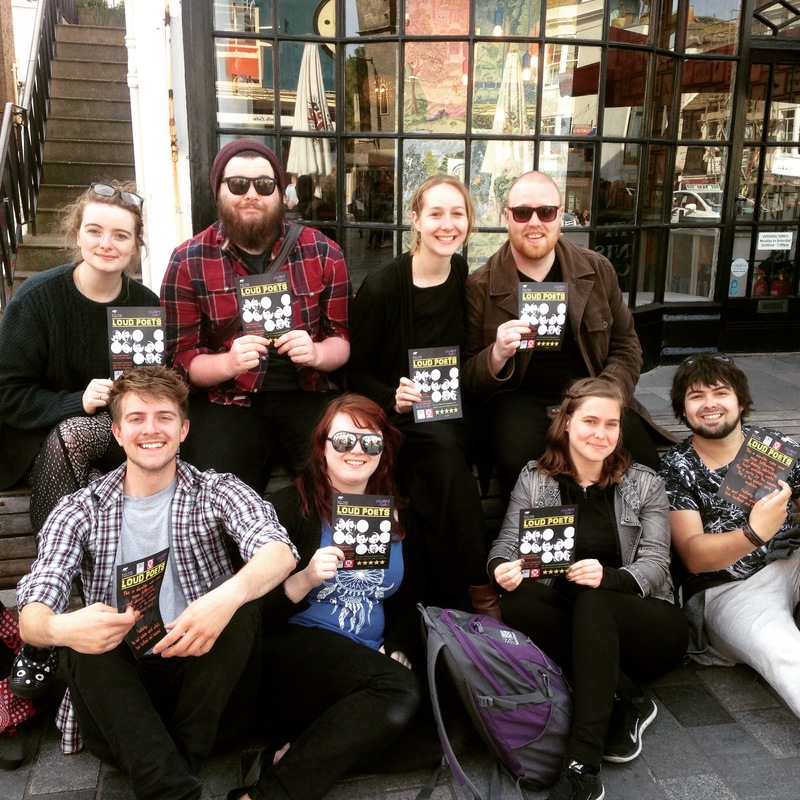 The rest was spent marketing (flyering, busking, constant updating and maintenance of social media platforms), networking, in tech rehearsals, setting up the venues, writing set lists, reflecting on the previous night’s show and making changes, individually rehearsing and physically preparing for the show, and seeing and promoting other Brighton Fringe shows. And add to that all of the preparation for the tour: the time spent actually writing and rehearsing the poems, formulating the show, sorting out tech cues for the show, booking hostels and renting cars for the trip, contacting venues, designing and printing posters . . . Then, on top of everything, trying to practice self-care and caring for tour-mates by trying to sleep enough, eat well, and give oneself mental space and down time. It’s a lot. So when my brain wondered, “Why are you so tired? You’re not actually working, you’re just on a poetry tour!” it became increasingly important to remind myself that just because I was on a tour promoting art doesn’t mean that that is not work. It’s the same old tune: we believe that art isn’t work, and that promoting art is always some glamorous rock star life with fancy riders and adoring groupies. But it is still work, so much work, to drum up audiences and perform at one’s highest level, every night. Lest it sound like I’m complaining: the tour was brilliant, full of so many joyous moments and the satisfaction of knowing we not only entertained hundreds of people with the show but also promoted the brand of Loud Poets to a different region in another country, helping to expand our fan base (and the fan base for spoken word more generally). I am so delighted to have been a part of it and I’m looking forward to doing much more touring in my professional future. A massive thank you to Loud Poets for giving me this brilliant opportunity and challenging me to bring my best work to the stage (and streets, and social media) every day. If you’re interested in seeing photos, videos, or reviews of the tour, please check out the Loud Poets Twitter feed, Facebook, Instagram, YouTube channel, and even add us on our new Snapchat account (loudpoets)! Also, we were guests on Hayden Cohen’s Performers’ Podcast at the Brighton Fringe on Saturday and in addition to performing some poems, we talked about the stigmas around spoken word and some of the Free Fringe controversy at the Edinburgh Fringe. Check out the conversation here. Thanks for reading: back to regular posts next week!